What does it mean to be Asian-American? An exhibit at the Smithsonian's National Portrait Gallery in Washington features the work of seven Asian-American artists who attempt to address that complex question through their art. The Smithsonian's National Portrait Gallery and the Smithsonian Asian Pacific American Program have joined together to mount a major exhibit showcasing the work of seven Asian-American artists. Each piece in the “Asian American Portraits of Encounter” exhibit is an expression by the artist of what it means to be Asian-American. Each of the artists was given an entire exhibit room, or hallway, in which to display their work, which includes photographs, drawings, paintings and even a short video. One of those artists is Roger Shimomura.The third-generation Japanese-American has spent his career fighting racial stereotypes through his art. He has paintings featured in the exhibit, in which his own image takes center stage. He describes "Shimomura Crossing the Delaware" as a knock-off of the iconic 19th century painting, “Washington Crossing the Delaware,” which depicts the first U.S. president at a historic moment during the American Revolution. The painting is part of a series born out of Shimomura's experience of being relocated with his family to an internment camp during World War II, when it was argued that Japanese-Americans were a threat to the nation. 'StripeTease' by Tam Tran explores the artist's changing relationship to her own developing identity. Shizu Saldamando was born and raised in California but her art makes strong references to her Japanese and Mexican heritage; two ethnic groups which have faced discrimination. In her series of portraits, the mixed-media artist has combined photographic images of her friends taken during casual social situations and presented them on a gold leaf background on wood panels to create a unique body of work. Fine art photographer CYJO was born in Seoul, South Korea, was raised in the U.S. and is now based primarily in Beijing. She is a self-described Kyopo - the Korean term for ethnic Koreans living in other countries. In 2004, she started photographing Koreans from all around the world. Two hundred forty full-body portraits make up CYJO’S KYOPO Project which is on display at the exhibit. Sixty of the images are enlarged and displayed individually. Actor Daniel Dae Kim's portrait by CYJO, is one of 240 full-body portraits of Koreans from all over the world. Zhang Chun Hong, or Hong Zhang as she is known in the United States, is a Chinese-born artist living and working in the U.S. She uses charcoal images of long, straight hair, presented as scroll paintings, to examine her identity as an Asian-American woman. Several artists in the exhibit focus on the challenges of transitioning from Asia to America. Performance artist Hye Yeon Nam who came to the U.S. from Korea to study art, depicts that struggle in a four-part video self-portrait titled "Walking, Drinking, Eating, and Sitting," where everyday functions are major challenges. 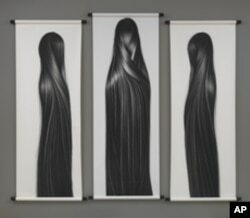 Chinese-born artist Hong Zhang's charcoal images of long, straight hair, examine her identity as an Asian-American woman. Satomi Shirai’s photographs reflect the feelings of dislocation she experienced after her move from Japan to New York City in 2004. And Tam Tran, who moved from South Vietnam with her family to Memphis, Tennessee, in the early 1990s, explores her ever-changing relationship to her own developing identity in a series of self-portrait photographs called Accents. “This show is a terrific opportunity for people who want to understand what an Asian-American portrait of encounter would feel, sound like in some instances, and have that experience, and then walk away from that, hopefully transformed and asking more questions about that topic,” he says.